Broken garage door spring ? Will your garage door not open / close ? Don't worry, Tri State Garage Door Services offers same day 24/7 garage door spring repair and replacement. 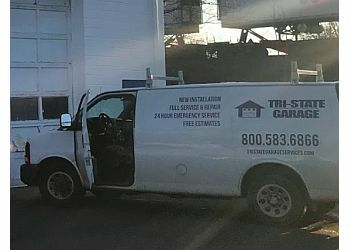 With fully stocked work trucks and impeccable customer service and workmanship; you can count on Tri State when you most need us 24 hours a day 7 days a week. We take immense pride in providing fast, reliable and affordable service throughout the Tri State area when its needed most. All of our technicians are local, with ALL the necessary parts and tools to get your garage door back up and running in no time. Tri State Garage Door Services is fully licensed and insured with some of New York & New Jersey's very best and most experienced garage door mechanics. Trust Us With Your Repairs, We Can Fix It! A broken torsion spring can cause garage doors to fall, leading to serious injuries or even death. Remember that garage doors can weigh several hundred pounds—enough to crush a human being. Repairing a torsion spring requires specialized tools both for safety reasons and to correctly wind the spring so that it doesn’t snap under the immense pressure. Extension springs are found on the horizontal sides of the garage door tracks. It helps your door lower smoothly so that it’s safe and controlled. As the springs wear out, the garage door will begin to close more erratically, and this is typically a sign of a damaged extension spring. The right spring for your garage door has to be installed as a replacement. If the tension isn’t equalized, then the door will continue to open and close in an erratic fashion. Quality springs must also be used to prevent rust and corrosion, thus increasing the lifespan of the garage door and the entire mechanism. Whereas a broken torsion spring can cause the door to slam with a loud bang, a broken extension spring can fly off and cause serious damage to anyone or anything in its path. A torsion spring breaking will only cause damage to anyone in the immediate area. Furthermore an extension spring can snap and travel a great distance at terrifying speeds. As mentioned above, there are some real dangers when attempting DIY repairs on your garage door springs. There are many safety concerns and you’d be wise to contact a professional repair service instead of trying it yourself. The effect a badly installed spring has on the overall efficiency of the door is a big concern. Extension springs can make the opening and closing mechanism far more stable and smooth. Rather this is true only if it’s tuned correctly and the right parts are used. While most people do actually have access to things such as replacement springs, it’s never a bad idea to double-check with a professional service. Finally its smart just to get in touch with a contractor who can do the job professionally. Call Tri State Garage Door Services Today! In addition, trying to do a garage door spring repair yourself can put future contractors or even your family at risk. The springs can snap off their housings if they aren’t tensioned or installed incorrectly. As mentioned before, a broken torsion spring can cause the garage door to slam shut and potentially injure someone. A broken extension spring can come out of its housing and fly across the room. It can injure anyone it comes in contact with or potentially breaking something.